What is the Operating Cash Flow Formula? The Operating Cash Flow Formula is used to calculate how much cash a company generated (or consumed) from its operating activities in a period and it displayed on the Cash Flow StatementCash Flow Statement​A Cash Flow Statement (officially called the Statement of Cash Flows) contains information on how much cash a company has generated and used during a given period. It contains 3 sections: cash from operations, cash from investing and cash from financing.. The formula for each company will be different, but the basic structure is always three components: (1) net incomeNet IncomeNet Income is a key line item, not only in the income statement, but in all three core financial statements. While it is arrived at through the income statement, the net profit is also used in both the balance sheet and the cash flow statement., (2) plus non-cash expensesNon Cash ExpensesNon cash expenses appear on an income statement because accounting principles require them to be recorded despite not actually being paid for with cash. 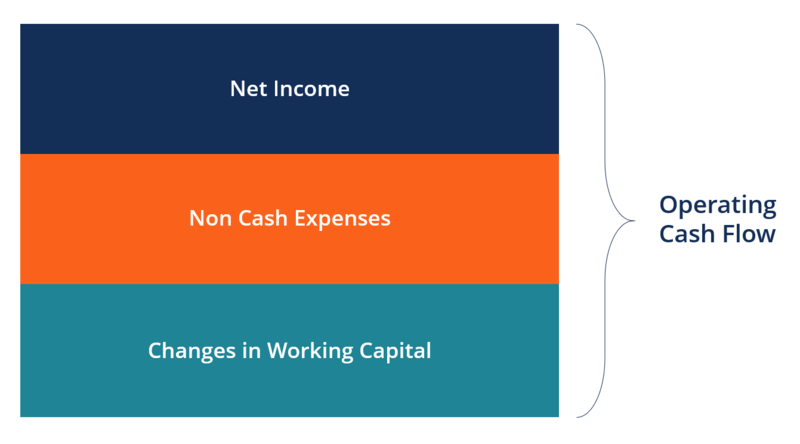 The most common example of a non cash expense is depreciation, where the cost of an asset is spread out over time, (3) plus the net increase in net working capitalNet Working CapitalNet Working Capital (NWC) is the difference between a company's current assets (net of cash) and current liabilities (net of debt) on its balance sheet. It is a measure of a company’s liquidity and its ability to meet short-term obligations as well as fund operations of the business. The ideal position is to. The simple formula above can be built on to include many different items that are added back to net income, such as depreciation and amortizationDepreciation ExpenseDepreciation expense is used to reduce the value of plant, property, and equipment to match its use, and wear and tear over time. Depreciation expense is used to better match the expense of a long-term asset to the revenue it generates., as well as an increase in accounts receivableAccounts ReceivableAccounts Receivable (AR) represents the credit sales of a business, which are not yet fully paid by its customers, a current asset on the balance sheet. Companies allow their clients to pay at a reasonable, extended period of time, provided that the terms are agreed upon., inventory, and accounts payableAccounts PayableAccounts payable is a liability incurred when an organization receives goods or services from its suppliers on credit. Accounts payables are expected to be to be paid off within a year’s time, or within one operating cycle (whichever is longer). AP is considered one of the most liquid forms of current liabilities. By making all adjustments to net income, we arrive at the actual, net amount of cash received or consumed by the business. Learn this formula step by step in CFI’s Financial Analysis Fundamentals Course. Net incomeNet IncomeNet Income is a key line item, not only in the income statement, but in all three core financial statements. While it is arrived at through the income statement, the net profit is also used in both the balance sheet and the cash flow statement. is the net after-tax profit of the business from the bottom of the income statementIncome StatementThe Income Statement (or Statement of Profit and Loss) shows performance from operations of a business. The financial statement begins with revenues and. It is the link between the income statement and the cash flow statement. To learn more about how the statements are deeply interconnected, read CFI’s guide to linking the three financial statementsHow the 3 Financial Statements are LinkedHow are the 3 financial statements linked together? We explain how to link the 3 financial statements together for financial modeling and valuation in Excel. Connections of net income & retained earnings, PP&E, depreciation and amortization, capital expenditures, working capital, financing activities, and cash balance. Non-cash expensesNon Cash ExpensesNon cash expenses appear on an income statement because accounting principles require them to be recorded despite not actually being paid for with cash. The most common example of a non cash expense is depreciation, where the cost of an asset is spread out over time are all accrual-based expenses that are not actually paid for with cash or credit in a given period. The most common examples of non-cash expenses include depreciation, stock-based compensation, impairment chargesGoodwill Impairment AccountingA Goodwill Impairment occurs when the value of goodwill on a company's balance sheet exceeds the tested accounting value by the auditors resulting in a write-down or impairment charge. Per accounting standards, goodwill should be carried as an asset and evaluated yearly. Companies should assess if an impairment is, and unrealized gains or losses. Non-cash working capital is all current assetsCurrent AssetsCurrent assets are all assets that can be reasonably converted to cash within one year. They are commonly used to measure the liquidity of a company. A company’s assets on its balance sheet are split into two categories – current assets and non-current assets (long-term or capital assets). (except for cash) less all current liabilitiesCurrent LiabilitiesCurrent liabilities are financial obligations of a business entity that are due and payable within a year. A company shows these on the balance sheet. A liability occurs when a company has undergone a transaction that has generated an expectation for a future outflow of cash or other economic resources.. An increase in current assets causes a reduction in cash, while an increase in current liabilities cases an increase in cash. Accounts receivableAccounts ReceivableAccounts Receivable (AR) represents the credit sales of a business, which are not yet fully paid by its customers, a current asset on the balance sheet. Companies allow their clients to pay at a reasonable, extended period of time, provided that the terms are agreed upon. Prepaid expensesPrepaid ExpensesPrepaid expenses represent expenditures that have not yet been recorded by a company as an expense, but have been paid for in advance. In other words, prepaid expenses are expenditures paid for in one accounting period, but that will not be recognized until a later accounting period. Now that you understand the basic structure of how the math and accounting works, let’s look at a detailed example using Amazon’s 2017 10-k10-KForm 10-K is a detailed annual report that is required to be submitted to the U.S. Securities and Exchange Commission (SEC). The filing provides a comprehensive summary of a company’s performance for the year. It is more detailed than the annual report that is sent to shareholders. As you can see, it works out to be quite a long formula, but it still consists of the three basic sections we’ve explored at the top of this guide. Learn how to calculate cash flow step by step in CFI’s Financial Analysis Fundamentals Course. 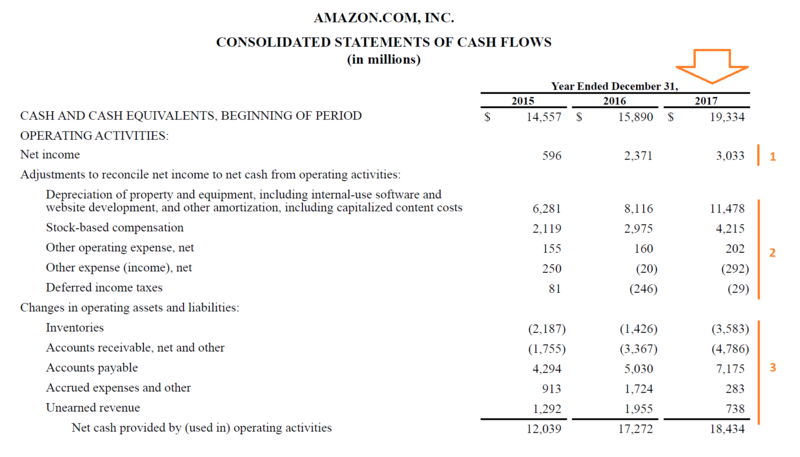 This part is very straightforward; it simply begins with Amazon’s 2017 net income of $3,033 million, taken directly from the income statementIncome StatementThe Income Statement (or Statement of Profit and Loss) shows performance from operations of a business. The financial statement begins with revenues and. Depreciation and amortization represent the accrual-based expensing of capital the company invested in maintaining its property, equipment, website, software, etc. Since the capitalCapitalCapital is anything that increases one’s ability to generate value. It can be used to increase value across a wide range of categories such as financial, social, physical, intellectual, etc. In business and economics, the two most common types of capital are financial and human. Examples has already been spent on these items, the expense is added back. There are various depreciation methodsDepreciation MethodsThe most common types of depreciation methods include straight-line, double declining balance, units of production, and sum of years digits. There are various formulas for calculating depreciation of an asset a company can use. Stock-based compensation must be recorded as an expense on the income statement, but there is no actual outflow of cash. Since the company pays the CEOCEOA CEO, short for Chief Executive Officer, is the highest-ranking individual in a company or organization. The CEO is responsible for the overall success of an organization and for making top-level managerial decisions. Read a job description, CFOWhat Does a CFO DoWhat does a CFO do - the job of the CFO is to optimize a company's financial performance, including: reporting, liquidity, and return on investment. Within a company, these responsibilities fall into departments typically known as the controller's group, treasury, and financial planning and analysis (FP&A), and other employees with stockStockWhat is a stock? An individual who owns stock in a company is called a shareholder and is eligible to claim part of the company’s residual assets and earnings (should the company ever be dissolved). The terms "stock", "shares", and "equity" are used interchangeably., the company issues shares instead of giving them cash. There is definitely an economic cost to stock-based compensationStock Based CompensationStock Based Compensation (also called Share Based Compensation or Equity Compensation) if a way of paying employees, executives, and directors or a company since it dilutes other shareholders. However, when calculating operating cash flow, it must be added back. Other operating expenses and other operating income can be found in the notes to the financial statementsThree Financial StatementsThe three financial statements are the income statement, the balance sheet, and the statement of cash flows. These three core statements are intricately linked to each other and this guide will explain how they all fit together. By following the steps below you'll be able to connect the three statements on your own., and in Amazon’s case, it includes intangible asset amortization expenses, which is very similar to depreciation. Other income refers to foreign currencyCurrency RiskCurrency risk, or exchange rate risk, refers to the exposure faced by investors or companies that operate across different countries, in regard to unpredictable gains or losses due to changes in the value of one currency in relation to another currency. gains and gains on marketable securities. Deferred income taxes refer to the difference between the income taxesAccounting For Income TaxesIncome taxes and its accounting is a key area of corporate finance. Having a conceptual understanding of accounting for income taxes will allow a company to to maintain financial flexibility. Tax is an intricate field to navigate and often confuses even the most skilled analysts. the company recorded on its income statement and the taxes it actually has paid to the government. Companies typically keep two sets of accounting books, one for shareholders and one for filing taxes. Inventory increased by $3,583 million in the period, which resulted in that amount of cash being deduced in the period (since an increase in inventory is a use of cash). Accounts receivable increased by $4,786 million in the period and thus reduced the cash in the period by that amount since there was more revenue unpaid by customers. Accounts payable was higher by $7,157 million, with more money owed to suppliers and vendors, which created a positive cash flow benefit for Amazon in 2017. Finally, accrued expenses increased (a benefit to cash flowThe Ultimate Cash Flow Guide (EBITDA, CF, FCF, FCFE, FCFF)This is the ultimate Cash Flow Guide to understand the differences between EBITDA, Cash Flow from Operations (CF), Free Cash Flow (FCF), Unlevered Free Cash Flow or Free Cash Flow to Firm (FCFF). Learn the formula to calculate each and derive them from an income statement, balance sheet or statement of cash flows) and unearned revenue (also called deferred revenueDeferred RevenueDeferred revenue is generated when a company receives payment for goods and/or services that it has not yet earned. In accrual accounting, revenue is only recognized when it is earned. 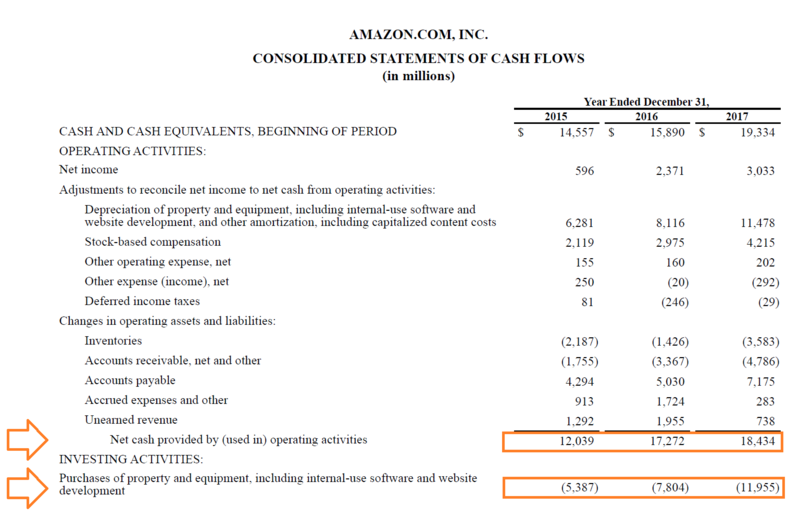 If a customer pays for good/services in advance, the company does not record any revenue on its income statement and instead records a) when added up and resulted in more operating cash flow in the period for Amazon. To learn more, check out CFI’s Business Valuation Modeling Course. While the operating cash flow formula is great for assessing how much a company generated from operations, there is one major limitation to the figure. All of the non-cash expenses that are added back are not accounted for in any way. The offsetting effect of depreciation and amortization is capital expendituresCapital ExpendituresCapital expenditures refer to funds that are used by a company for the purchase, improvement, or maintenance of long-term assets to improve the efficiency. By taking capital expenditures into account, we are using the Free Cash Flow (FCF) formulaFree Cash Flow (FCF) FormulaThe FCF Formula = Cash from Operations - Capital Expenditures. FCF represents the amount of cash flow generated by a business after deducting CapEx. The FCF formula is Free Cash Flow = Operating Cash Flow – Capital Expenditures. In 2017, free cash flowFree Cash Flow (FCF)Free Cash Flow (FCF) measures a company’s ability to produce what investors care most about: cash that's available be distributed in a discretionary way is calculated as $18,343 million minus $11,955 million, which equals $6,479 million. This represents the amount of cash generated after reinvestment were main back into the business. Thank you for reading this guide to understanding the Operating Cash Flow Formula, and how cash flow from operations is calculated and what it means.